Community involvement, transformation, and innovation are all hallmarks of the Oak Park Education Foundation’s 25 years in the Oak Park public schools. The Wednesday Journal celebrated OPEF with three articles and lots of photos in a 12-page special section. “Our community in the classroom” talked about how OPEF invites community members to share their expertise in the classroom. Artists, scientists, architects, engineers help bring real-world relevance to the children’s education. “Sculpting hope, peace and wonder at Beye School” shows the lasting impact that OPEF programs like Art Start can have on the participants — students and experts alike. 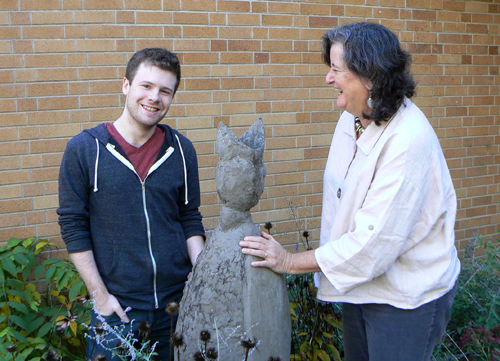 The article features local artist Margot McMahon and former student participant (now adult!) Paul Whalen (see photo above). “Innovation leads the way” includes interviews with two OPEF program coordinators, Jenny Roen and Tim Walsh. They talk about how OPEF stays innovative with programs like BASE Camp and VEX Robotics. Thanks to the businesses who support OPEF and helped make this special section possible: Hodges, Loizzi, Eisenhammer, Rodick & Kohn LLP, Marion Street Market, Aria Architects, Community Bank, and Oak Park District 97.